Efi system components - The EFI system stands for electronic fuel injection. it is a series of electrical machinery that serves to supply gasolinesl from fuel tank to the combustion chamber with an ideal volume. From the above explanation, it can be concluded that the electronic fuel injection is a system that replace carburetor system. The working principle of the EFI system is to use real time calculations to find out how much gasoline needs right then and there. This causes the comparison of gasoline and air in the EFI engine is always ideal under any circumstances. Fuel tank function is to contain of gasoline as a source of power from the vehicle. Vehicle produced below 2000 may still be found tanks made of metal plate. But in today's, many fuel tanks are made of thick plastic materials that have light weight but are strong enough to accommodate fuel. Although lightweight, the weakness of plastic tank is prone to leak when exposed to impact. Gasoline filter serves to filter the dirt carried by the flow of gasoline when crossing the fuel feed. With this filter, the gasolines that flow to the injector will be in clean condition. Rough filter, made of knitted wire that has a large enough pore. Its function as a large solid dung filter. Second is smooth filter, made of materials such as cloth with smaller pores so as to filter the dirt of small particles. In the fuel filter there is also a sedimenter water that serves to separate the water if there is water carried by the flow of gasoline. To flow gasoline from tank to injector. 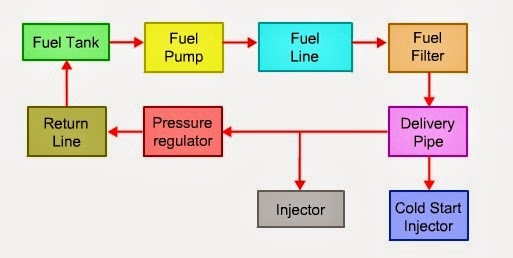 Increase fuel pressure on fuel feed. Fuel pump are not only on the EFI system, but on the carburetor engines are also provided fuel pump. But on the EFI system, fuel pump is driven by electrical energy. So it does not burden the machine. The location of the fuel pump is also hidden submerged in the fuel tank. Delivery pipe are a hard pipe located at the end of the gasoline line (in injectors), its function is to accommodate gasoline pumped by fuel pump. Delivery pipe is usually made of a harder material, because this is where the intersection between the gasoline channel and all the injectors. When viewed, this pipe has several holes consisting of inlet hose that is connected to the fuel pump inside the tank and the injector hose connected to all the injectors. The function of injectors are to spray the gasoline from the delivery pipe with the right composition. The injector works using a solenoid that open if ECU send the electrical curents. The time solenoid open, will influence to the gasolines sprayed from injectors. When in the normal position (engine off) this solenoid does not get the voltage so noozle on the injector does not open. While when the engine is cranking, the solenoid will be given voltage by ECU. The result is an axial that causes open noozle. Since the gasoline inside the delivery pipe was pressurized, then when the noozle opened the automatic gasoline will come out and sprayed. The length of time the electricity to the solenoid affects the composition of the gasoline out, the longer it will be more and more. Pressure regulator serves to keep the pressure inside the gasoline chanels remains stable. Pressure regulators are needed because to overcome the excess pressure caused by the gas pump that keeps on working. When the pressure of gasoline more tha normal, the gasoline will be flowed back to the tank until the pressure is stable. The small amount of pressure inside the gasoline channel also affects the composition of gasoline spray out from injectors. Fuel feed or also called fuel hose serves as a place to flow the gasolines from the tank to the injector. Generally, fuel hoses are made of materials such as mica that have light weight but strong hold gasoline pressurized. Only, the weakness of mica material lies in its strength when it is bent. It will break easily. Actually this hose is almost the same as fuel feed, but the return feed serves to drain the remaining gasoline when excess pressure back to the tank. In other word, this channel will flow back the rest of gasoline to the fuel tank. When talking about sensors, then we go into the electrical parts of EFI. There are three components of electrical efi, ie sensors, ECU and injectors. The sensors itself, have function as detecting device, which the results serve as a reference for the ECU to determine how long the injector opens/how much gasoline spray out of the injectors. There are several conditions that are sensed by the sensor, among others, air mass into the engine, the air temperature into the engine, and the opening angle of the sensor. But on the recent vehilce, the EFI system depends not only on the 5 sensors. There are several additional sensors to make the gasoline composition out of the injector more accurate. When the sensor functions to detect, the ECU serves to process the data obtained from the sensor. The data from the 5 sensors will be sent to the ECU, then the ECU will do the processing. The result of data processing in the ECU is a voltage across a certain time interval that is sent to the injector so that the noozle is open depending the length of voltage that sended by ECU. How the ECU can process data? If this, similar to a computer processor but which is processed there is electricity that has a varied voltage. And each voltage value has its own meaning. In conventional fuel systems, batteries do not be an important part. But on the EFI system, because the name is also Electronic fuel injection, then it means this system works electronically. Electronic goods definitely require an electric current, in other words the EFI system can not be run without the current from the battery. The function of the battery in the EFI system is to give reference voltage (generally 5 volts) which will be processed by the sensor so as to provide a voltage back to the ECU with a voltage value between 0 to 5 Volts.